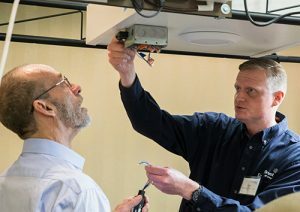 If you’re a commercial lighting trade ally, don’t miss the Energy Trust Lighting Workshop—Summer Session 2018 for training that’s effective and efficient. The workshop starts with a power-packed 60-minute interactive session on How to Increase Sales and Improve Customer Relationships, led by dynamic trainer Lenny Borer. Borer will teach new skills that can be applied directly for more successful customer interactions. Following his session, you’ll hear about lighting program updates and learn Lighting Tool tips to expedite projects. Reserve your spot now! When: Tuesday, August 7, 2018 from 7:30 a.m. to 10:00 a.m. If you have questions about the Energy Trust Lighting Workshop—Summer Session 2018, contact Gwen Lusk, trade ally coordinator, at 503.639.8899.